Teachers are bailing out of their jobs in record numbers…. More work piled on them…. Teachers and public education employees in the United States are reportedly quitting their jobs at a record rate. Public educators — including teachers, schools psychologists, janitors and community college faculty members — quit their jobs at a rate of 83 per 10,000 a month on average in the first 10 months of the year, data from the Labor Department seen by The Wall Street Journal revealed. According to the newspaper, that rate is the highest on record since the government began collecting such data in 2011. The rate of departures is also nearly double that of the 48 per 10,000 public education workers who quit their jobs in 2009. 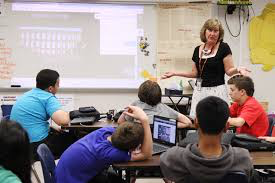 However, the report also points out that teachers are still less likely to leave their positions than other American workers, who reportedly quit their jobs at a rate of 231 per 10,000 this year. “During the recession, education was a safe place to be,” Julia Pollak, a labor economist at Zip Recruiter, told the publication. Teachers are leaving their jobs for a variety reasons, the newspaper reported….. In some places teachers have been getting knocked ever since they supported Obama back in 2008….